Choosing what kind of food to serve at your special event and how to serve it is a big decision – the food is often what many people look forward to and the thing they remember most about an event. Here’s a comparison of stations versus buffet catering and how to choose which type of serving style best fits your needs. Food Stations: A food station is like a miniature buffet – a counter, a way to keep food warm, and a serving attendant will all be present at a food station. Typically, a single station will be dedicated to one type of food. For example, you could have several stations categorized by type of dish, like meat, sides, and desserts. Or, you could have your stations each feature a different type of ethnic cuisine. Buffet Catering: Buffets are “comfort zone” for most people. Any type of food can be served at a buffet, and the dishes are typically served across one or two long tables. 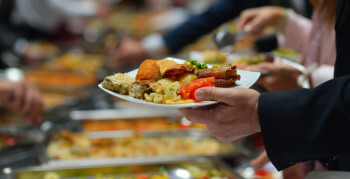 An attendant may be available to help serve food, or you may want to set up your buffet so guests portion themselves. Both types of serving allow guests to get up and get their own food and allow them to sample multiple varieties of foods and enjoy as much as they want. Choosing Food Stations – When & Why: A food station set up might be a great choice for a trendy wedding or a corporate holiday party. Food stations allow people to visit different stations and creates a less congested environment that promotes socialization. Also, food stations allow for a higher degree of creativity when it comes to serving dishes. Choosing a Buffet – When & Why: A buffet may be more suitable for some traditional corporate events or casual clambake or BBQ luncheons. A cocktail buffet might be a great way to satiate guests during the cocktail hour at a wedding before the actual meal starts. You can serve both classic dishes and innovative fare buffet style. Cost may play a role in what you choose, as well as what type of food you plan to have available. Also, how you serve the food at your event may be dictated by the event’s theme or even the décor. Ultimately, deciding whether to choose station or buffet catering is all about the impression you want to leave on your guests. Whether you’re planning a wedding, hosting a corporate party, or are having a casual birthday catered, Woodman’s of Essex can help. We can help you design a menu that perfectly fits your event and have experience in both food station and buffet style serving. Contact us today to start planning your next catered event!